"They who walk as bone, would walk upon your bones." 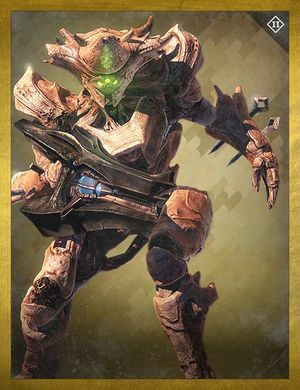 The Wretched Knight is a Hive Knight and boss enemy encountered in the Prison of Elders. Wretched Knights act as the enforcers of the Worm Keepers, using brute strength to keep the disparate Hive broods in the Prison of Elders in line. In return, the Wretched Knights hope to be rewarded with the spoils of the Light. The Wretched Knight behaves like a regular Knight except in Challenge of the Elders. In the Challenge of Elders the Wretched Knight gains the ability to summon floating Taken mines around the arena and push the player back with a ground punch. The punch does less damage than a regular melee. If the Wretched Knight is one of the bosses in the Challenge of Elders, the Hive room will have more banners than usual.